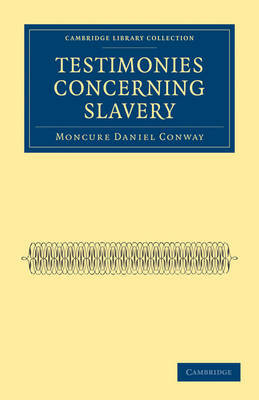 Moncure Conway (1832-1907) was born on his family's plantation in Virginia, but became a committed abolitionist soon after he left college. He joined abolitionist rallies and moved from Methodism to the Unitarian ministry, eventually becoming a freethinker. Conway became increasingly isolated from his family as a result of his abolitionist activism, his marriage to an abolitionist, and the resettling of a group of his father's escaped slaves in Ohio during the civil war. This book was published in 1865, soon after he settled in Britain, where he lived for over 30 years, became a supporter of women's suffrage, and networked with intellectuals including Dickens, Carlyle, Lyell and Darwin. His description of the injustices of slavery, including the slave trading in the southern plantations that triggered the secession of southern states and the civil war, is set in the context of his personal experiences and his evolving ethical views.